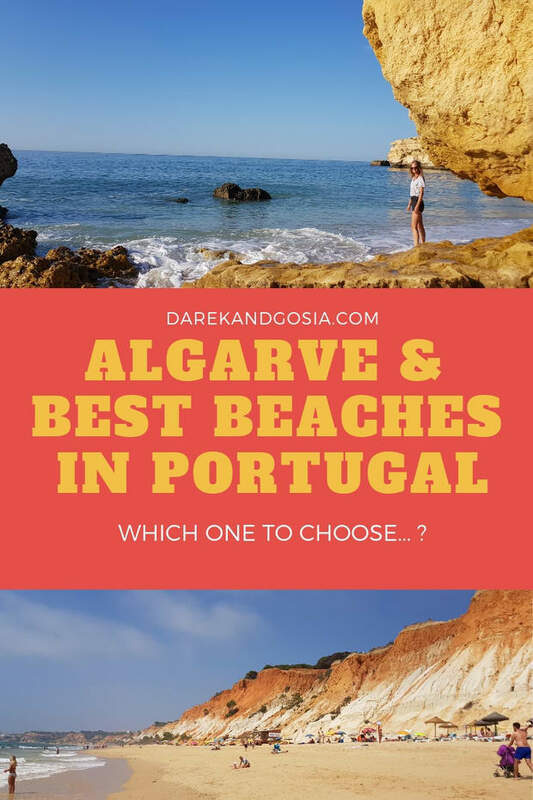 Best beaches in Algarve Portugal, places to visit & TOP things to do! 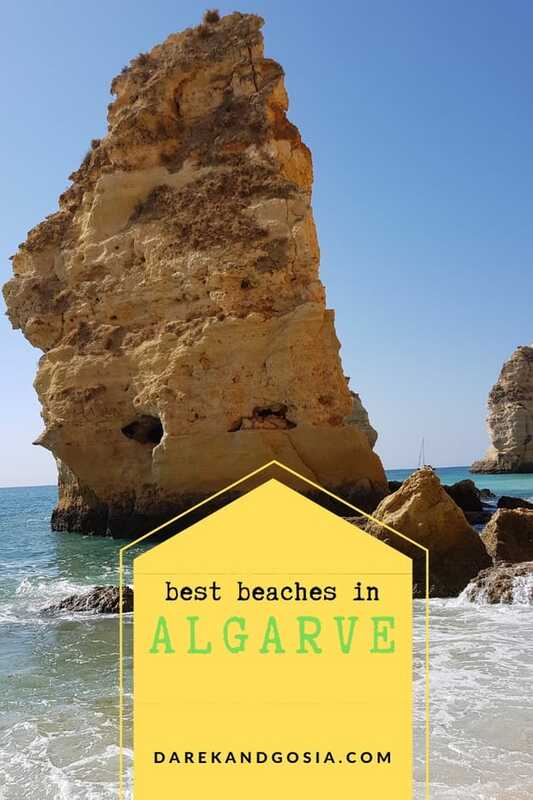 Home » Best beaches in Algarve Portugal, places to visit & TOP things to do! 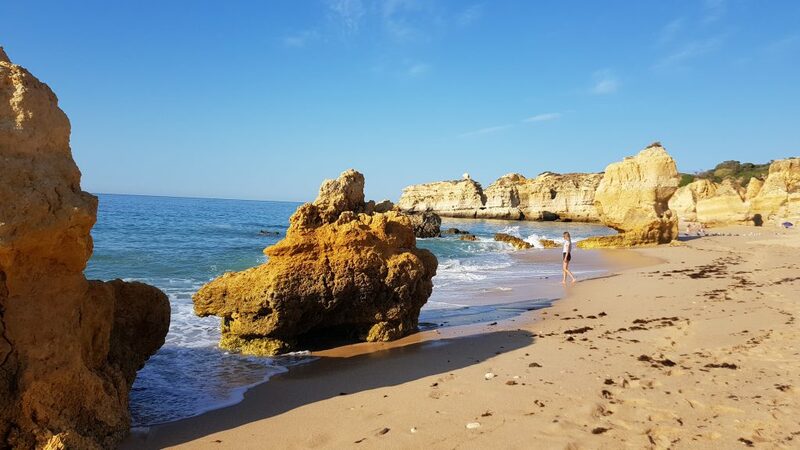 Read our guide to the best beaches in Algarve, Portugal to find your favourite South-Portuguese beach! 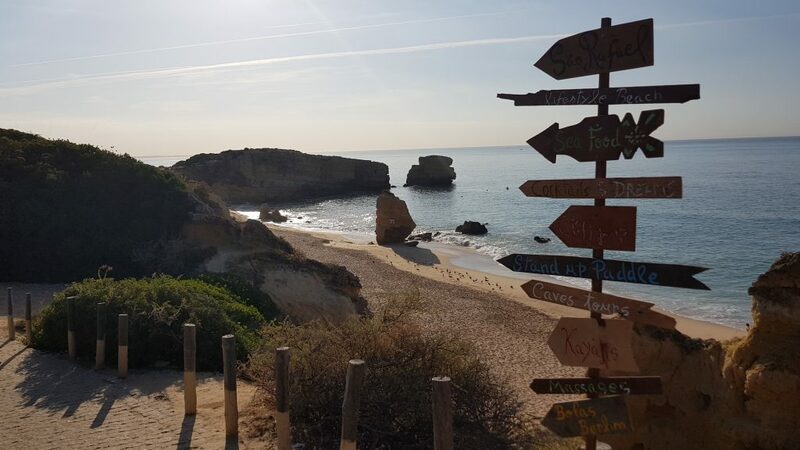 Where is Algarve actually located? This stunning and sunny region is located just on the edge of Europe, in southern Portugal. It’s been a very popular holiday destination among Brits for several years. 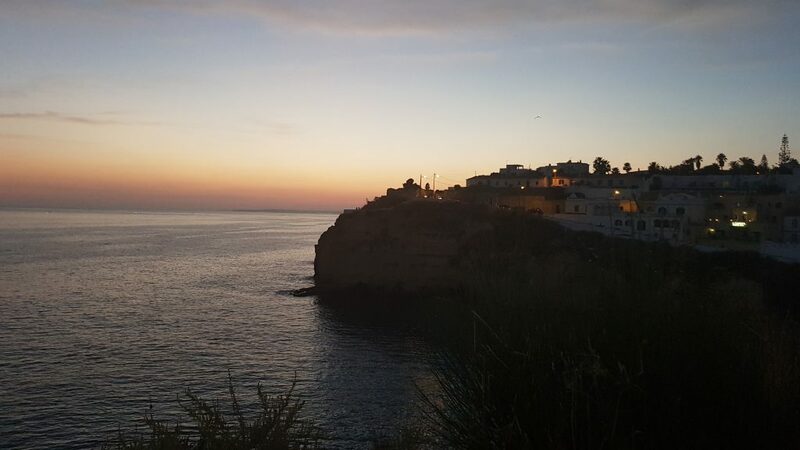 If you are thinking about visiting Algarve, you will definitely love this stunning region of south Portugal! 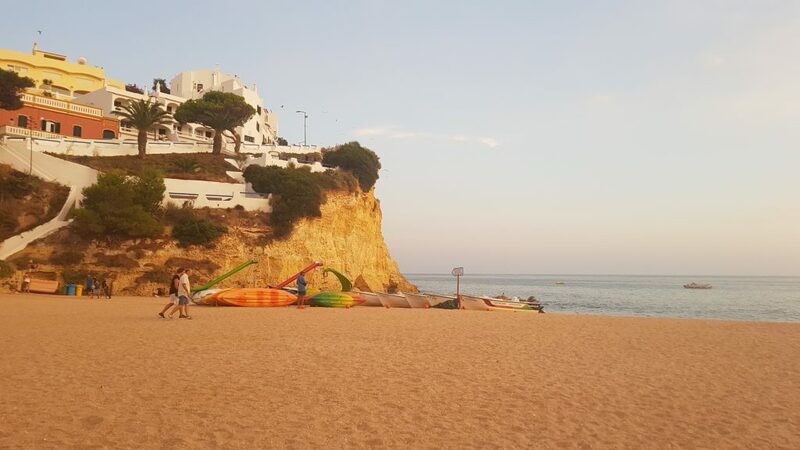 Golden sand and many little towns and cities (like Albufeira, Lagos or Carvoeiro) are really worth to visit. 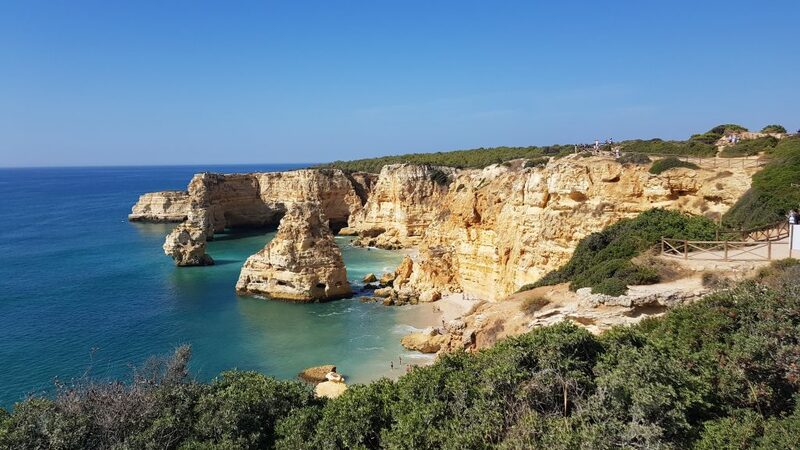 In addition, they are all surrounded by the best beaches in Algarve Portugal. 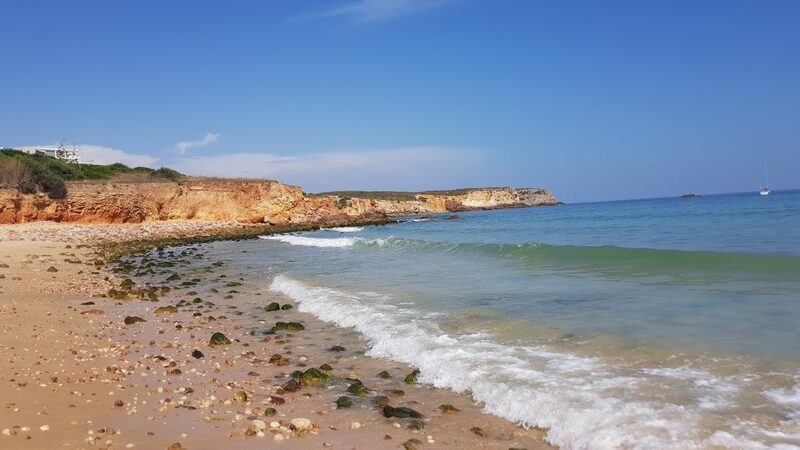 Just book a ticket and fly to Faro airport – your gate to Algarve in Portugal! 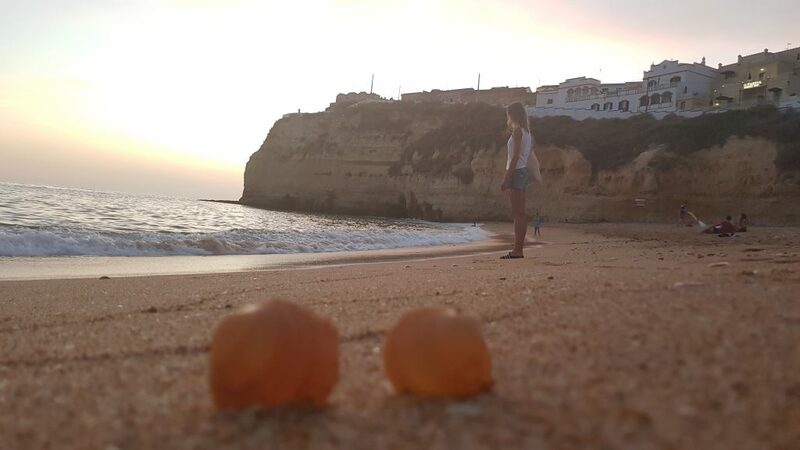 When to go to Algarve Portugal? 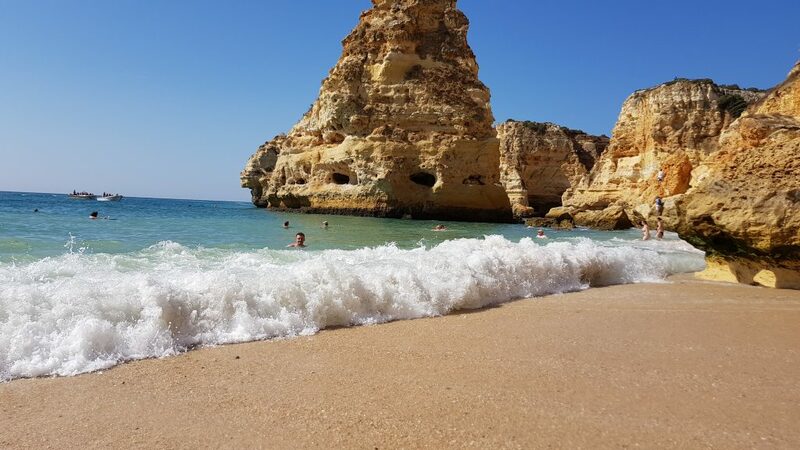 Definitely, the weather forecast will not disappoint you during your September holiday in the Portuguese region of Algarve. 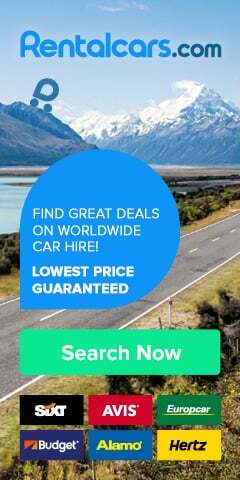 Rent a car to explore Algarve! 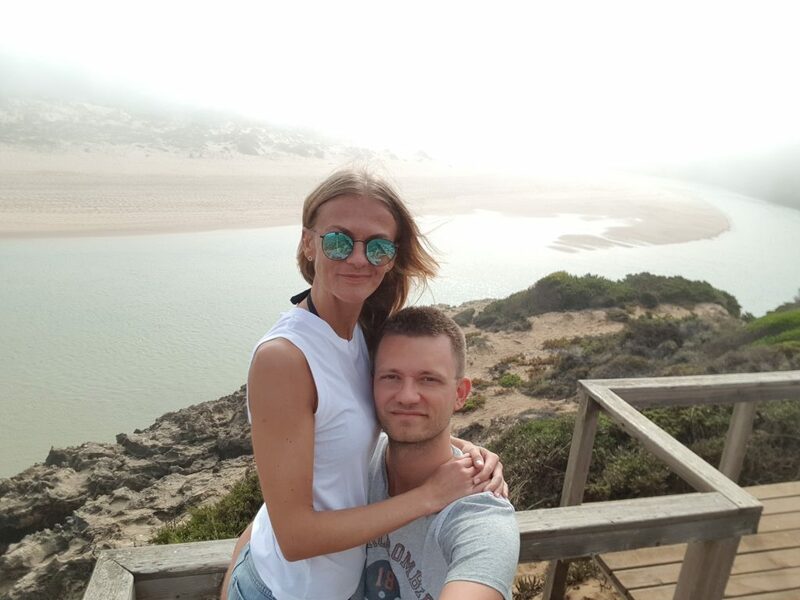 It is worth to say that car is the best option to travel in Algarve Portugal! It will give you much more flexibility in organising your days – so exploring less crowded places will be much easier. Nothing against buses in Algarve, as they go to many places as well, but unfortunately do not run too often. 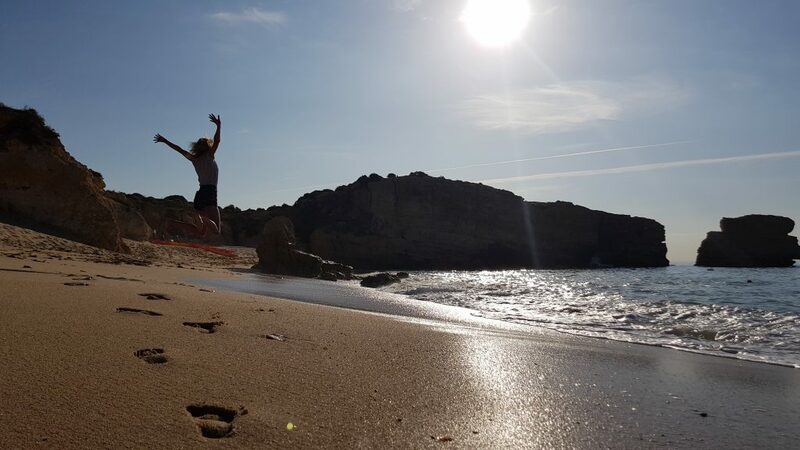 If you want to explore hidden beaches and get to places that can’t be reached by bus – travelling by car will work perfectly! 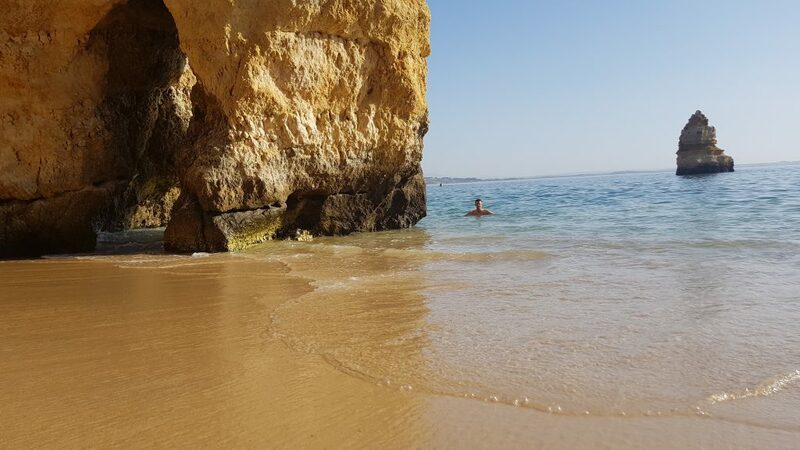 Where to find the best beaches in Algarve Portugal? Honestly! 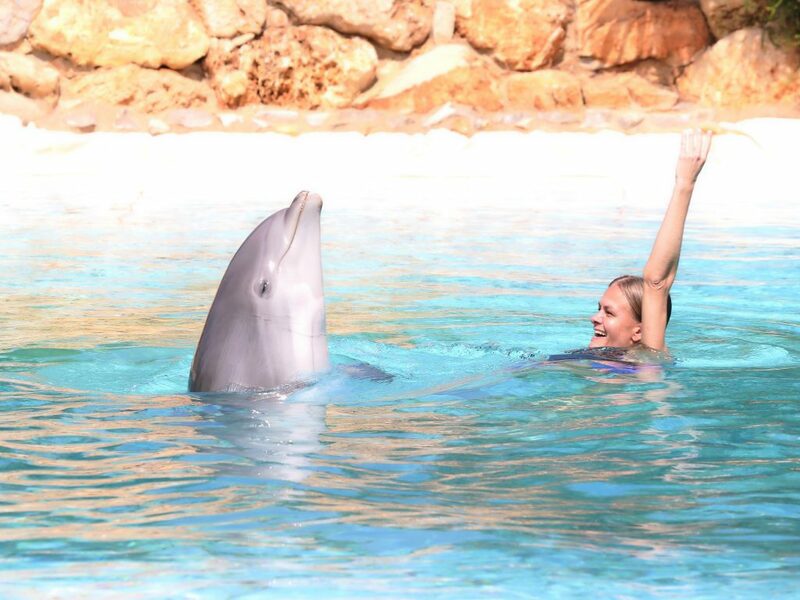 Just choosing those you want to visit during your trip to Algarve is a huge task itself. 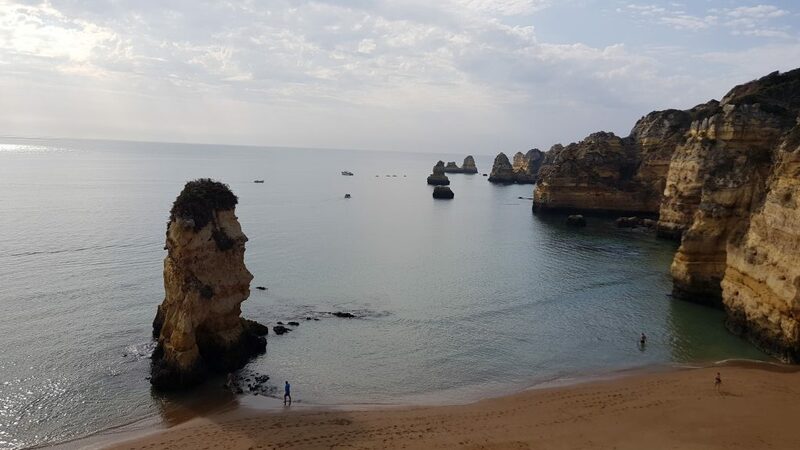 We have grouped them into 4 categories, based on the regions – so you can see below the top beaches around Lagos, Albufeira, Portimao and the West part of Algarve. 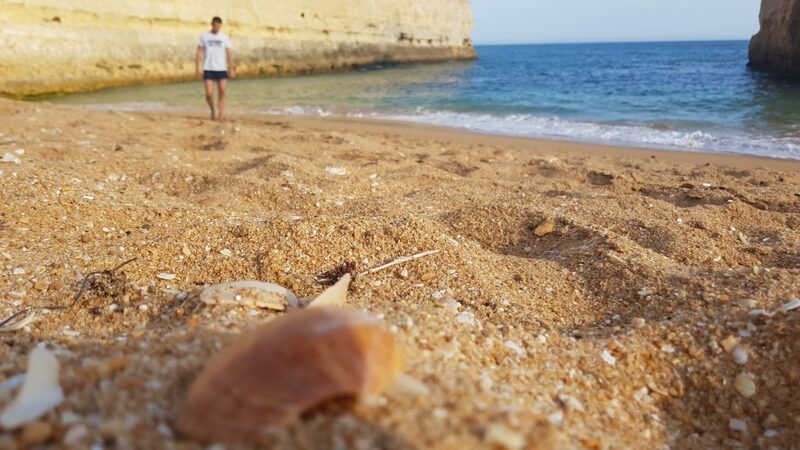 Fan of small hidden beaches? 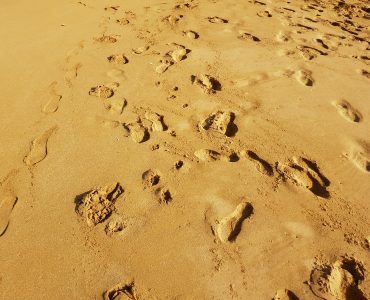 Or maybe endless long beaches with golden sand? 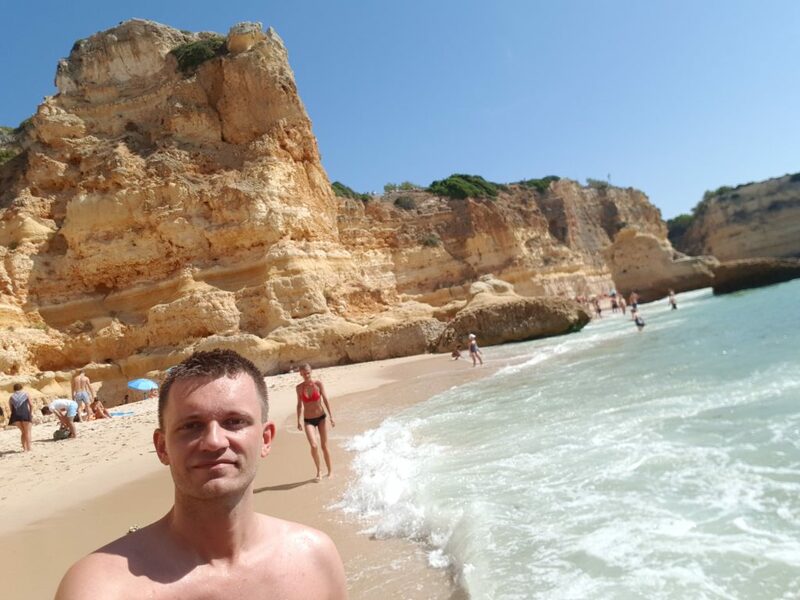 You will definitely find any sort of beach in the south of Portugal. Amazing views with picturesque cliffs and rocks emerging from the turquoise waters of the Atlantic. Another beach with spectacular views! It is very charming as it’s situated among the rocks. 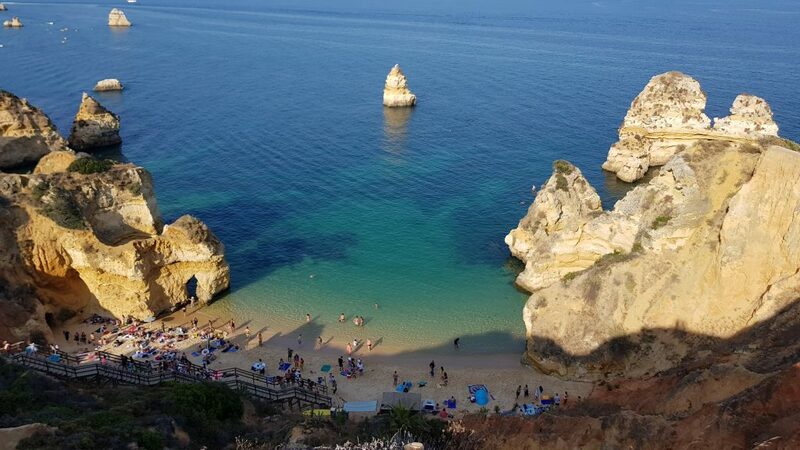 The beach is located near Ponta da Piedade. It’s very small and it consists of two parts connected by a short tunnel cut into the rock. There is lots of free parking available but gets crowded from around 11 am. 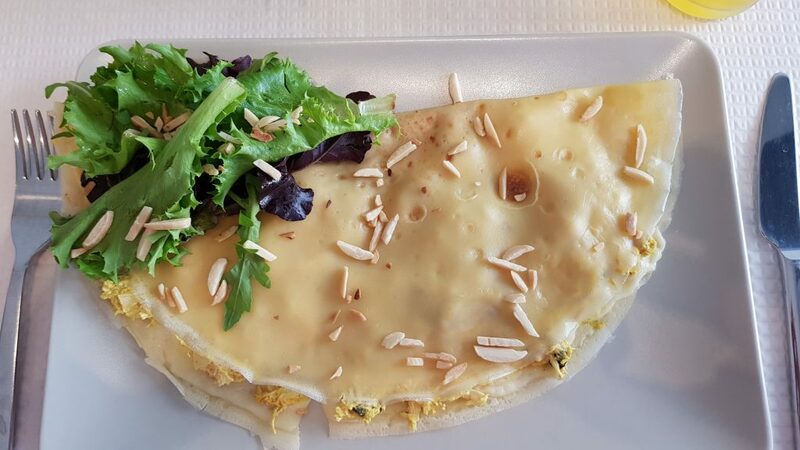 It is worth to note, that it will get very very busy around lunchtime. 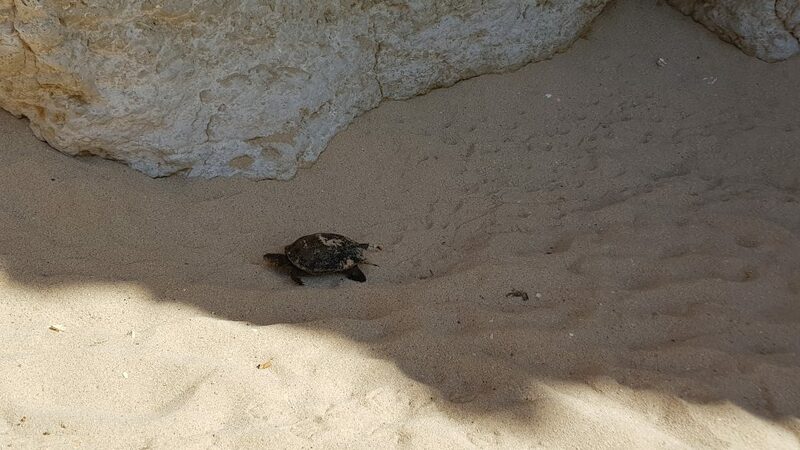 So, if you are not an early bird, you might have difficulty with finding a spot on the beach. Honestly! It gets very busy. Everybody wants to visit this remarkable beach! 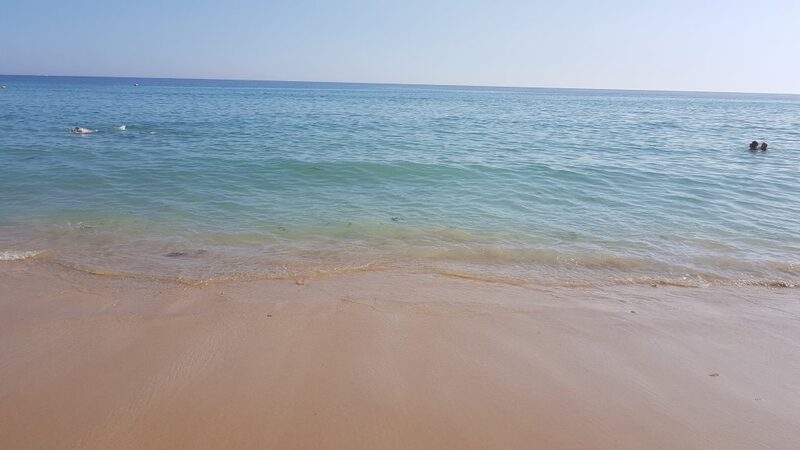 This beautiful sandy beach is only 10 minutes by car from Lagos. It is generally safe for swimming and also great for walking. There are no stones or rocks but beware of the current at times! Blue-green-ish water of the Atlantic, red and orange cliffs with dark green pinewoods is an amazing combination creating this spectacular landscape. 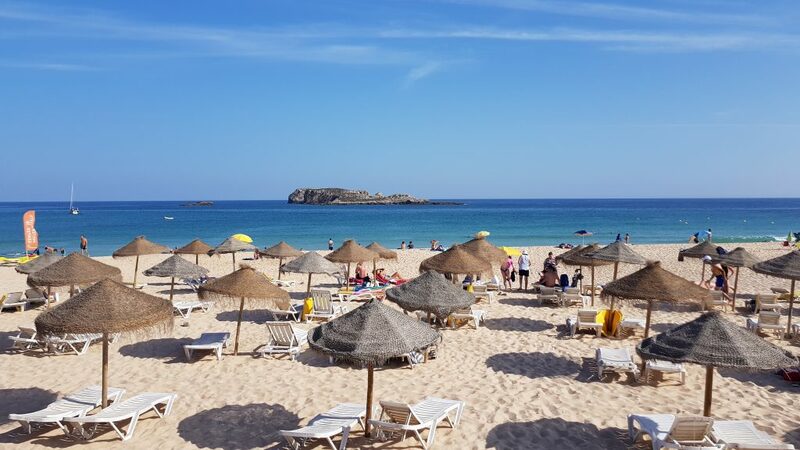 The beach has been awarded in many rankings as one of the best in Portugal. 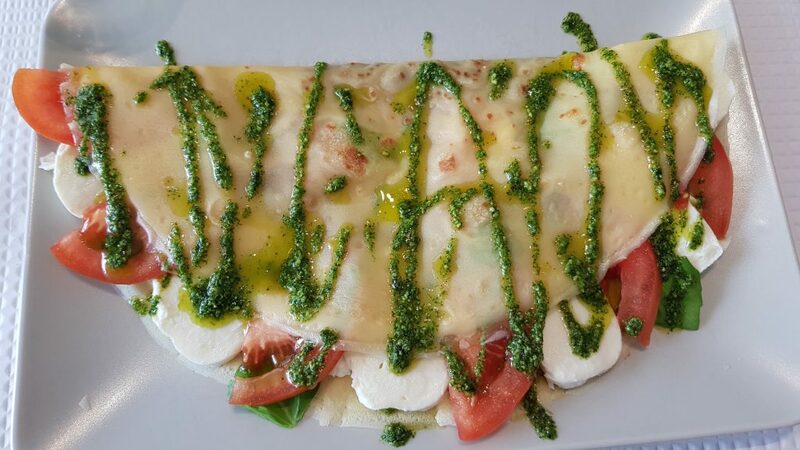 We definitely think is one of the best in Europe too! 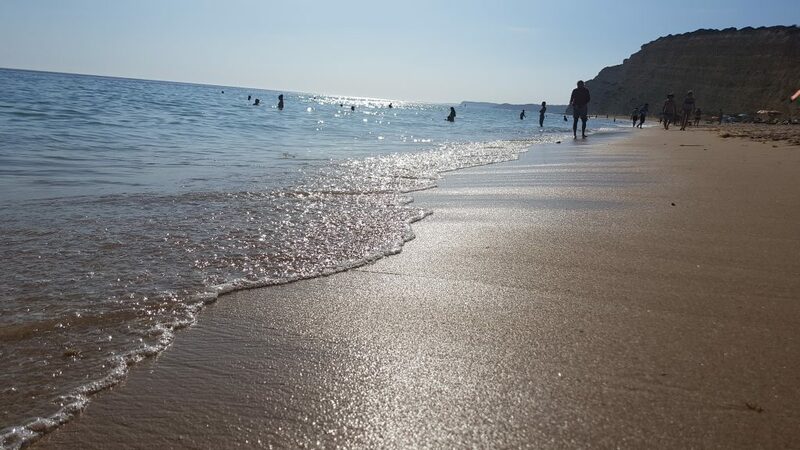 A perfect start to your holiday in Algarve! A very long brick staircase will lead comfortably down to the beach. Praia da Cova Redonda is really gorgeous and was not crowded when we visited it. 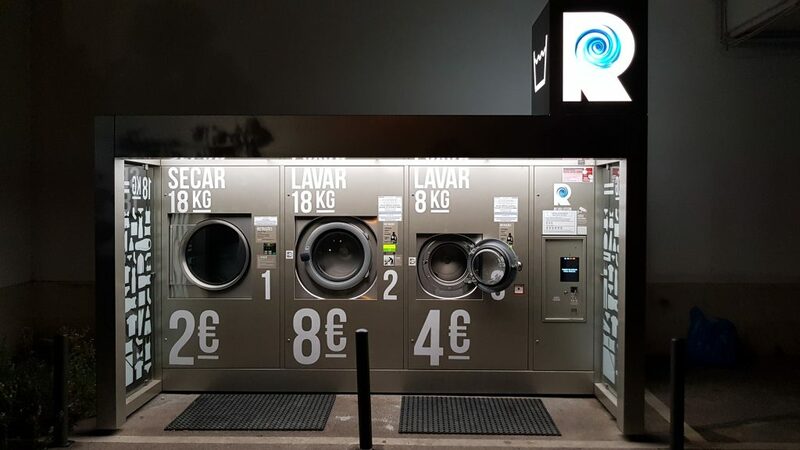 There is a small kiosk where you can buy drinks, ice cream or some snacks. 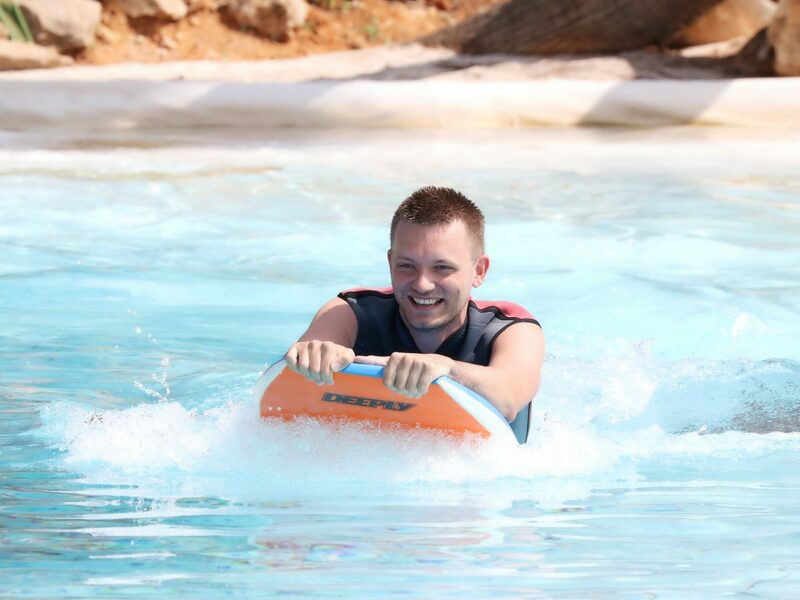 Umbrellas, sunbeds and water sports activities are also available and can be rented there cheap. 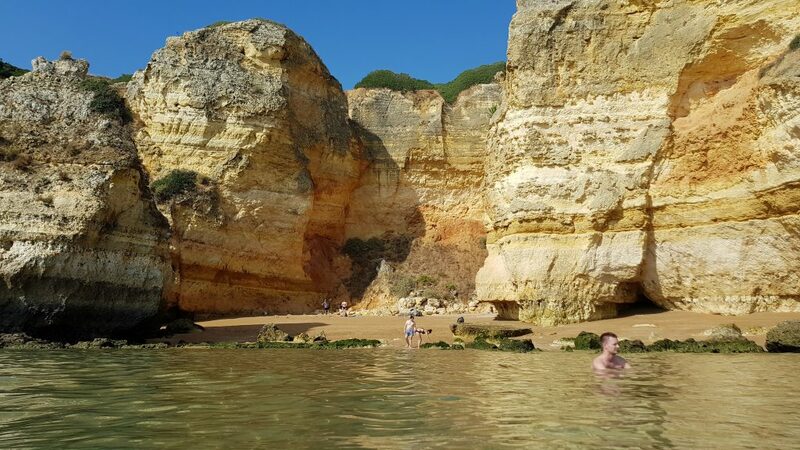 The beach lies in the middle of the Algarve coast and is surrounded by cream-red cliffs. 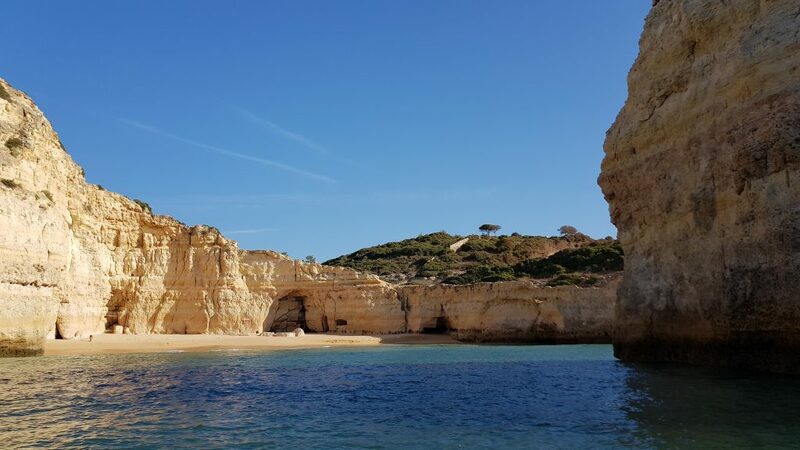 Its most characteristic features are the rock formations located on the beach and in the water – some of them have even names (like Ponte Pequena – a small bridge). 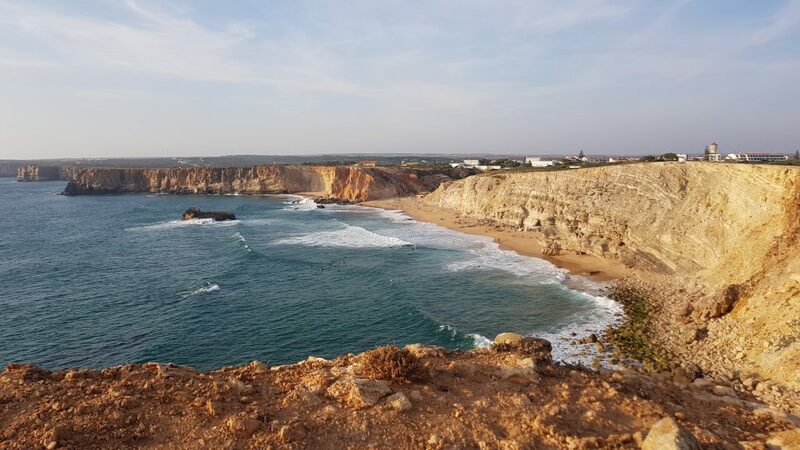 If you are staying in Lagoa region you will only need 15 minutes by car to get to the small Portuguese village of Benagil. 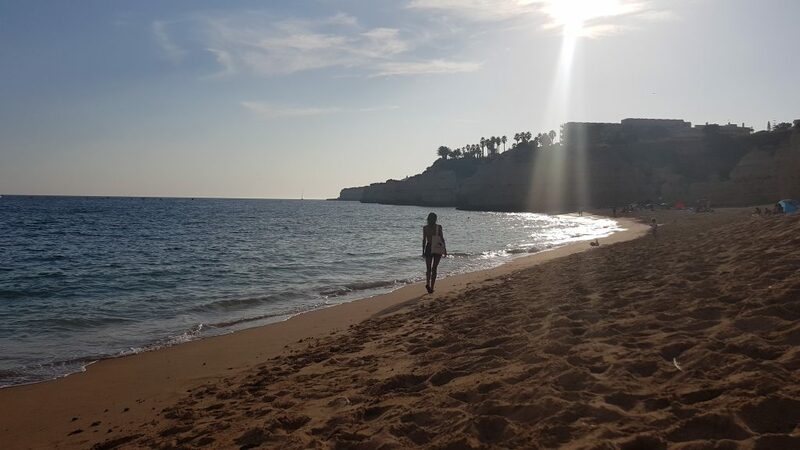 There are few parking spaces next to the beach, but it will be much easier to leave your car at the top of the hill – just 5 minutes walk to the Benagil beach. There is no tourist infrastructure around the beach which is also a great sigh as there will be fewer people visiting it. Yes, it is a bit difficult to find the beach but that only adds to its charm! 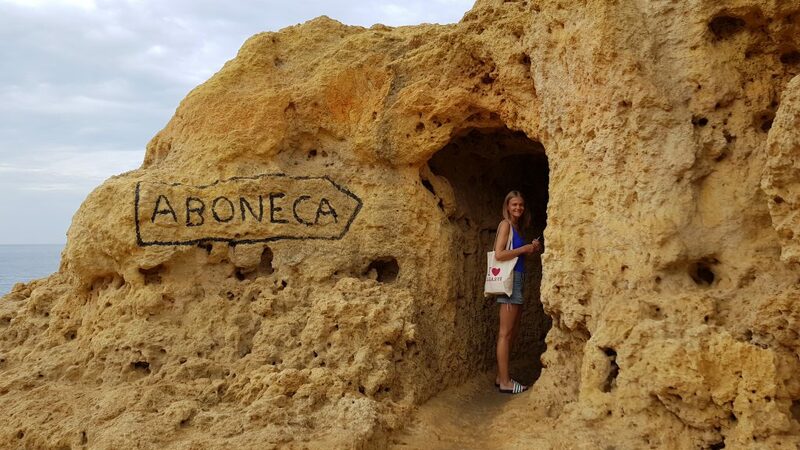 To get to the beach, you will have to go through a tunnel carved in the rock – very adventures. 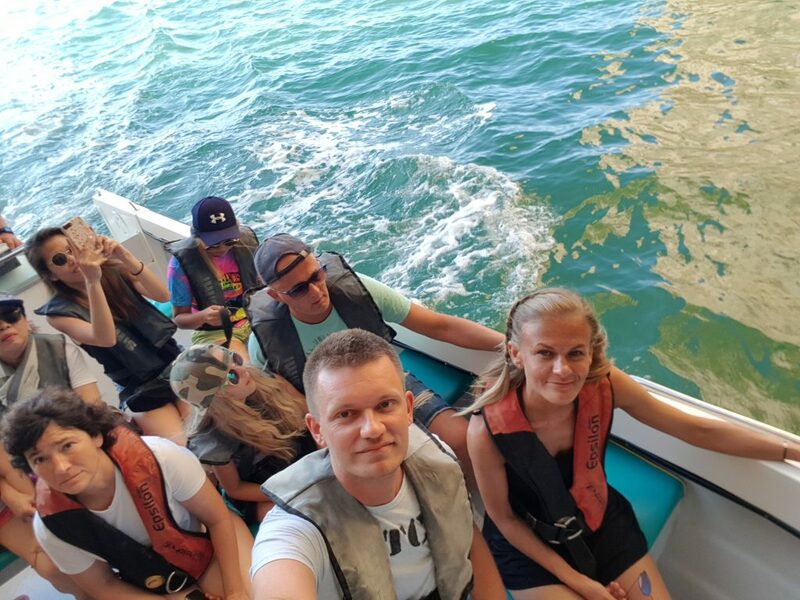 Unfortunately, we have only seen the beach from the water, during our boat trip. 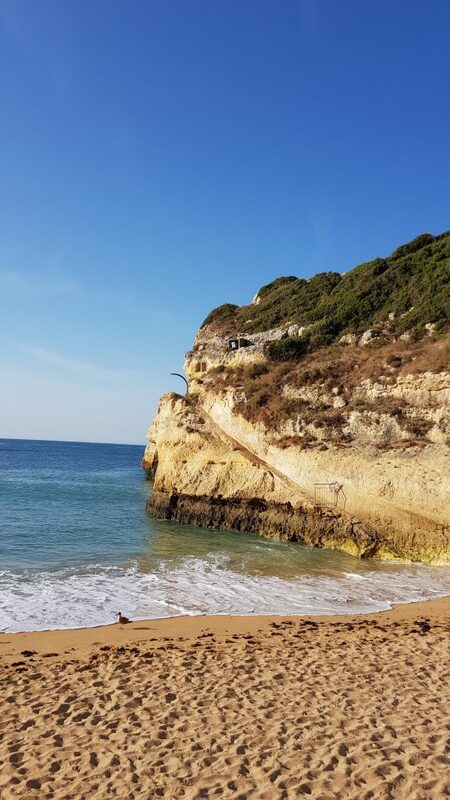 Praia da Marinha is one of the most beautiful beaches in Europe – it is definitely a place that you have to visit while staying in the Algarve! 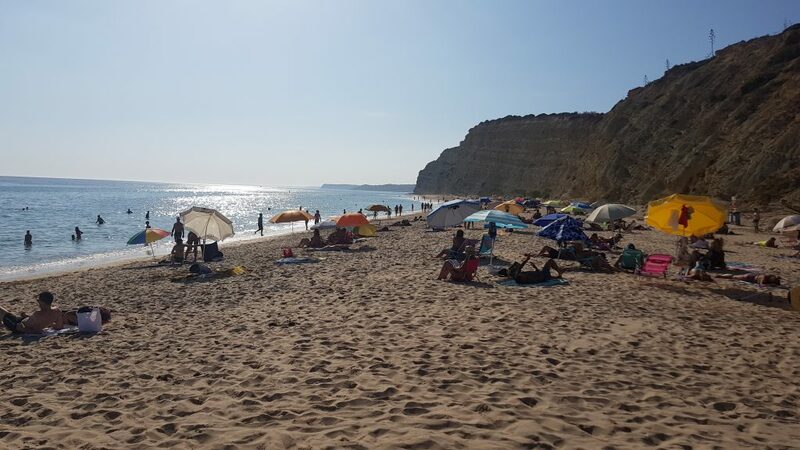 The beach is located 16 kilometres east from Portimão, just a short 25-minutes drive. 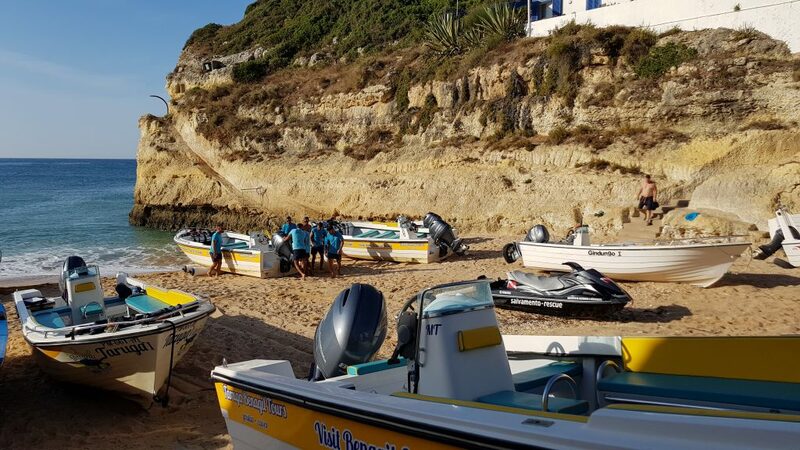 If you have rented a car, this will be the best way to get to Praia da Marinha. There is a sufficient amount of parking spaces but make sure you get there in the morning as in high season it will be very crowded later in the day. 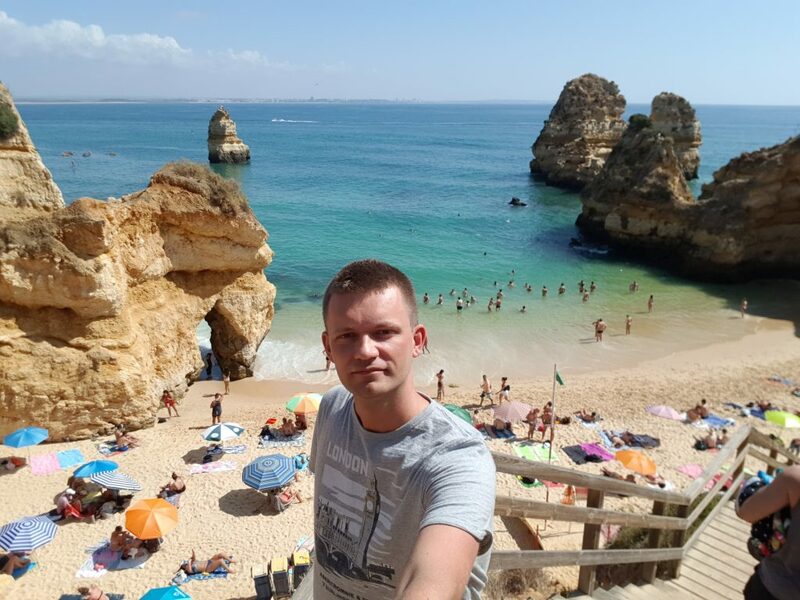 The surrounding 30-meters high rocks makes the beach famous not only in Europe but also in the whole world. 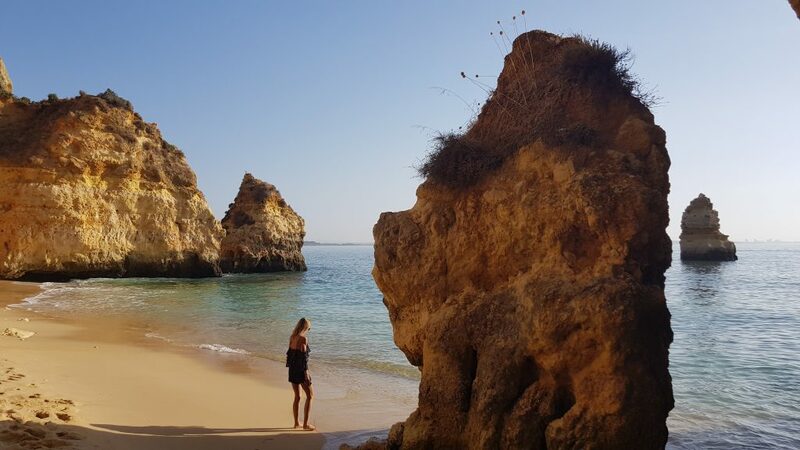 Make sure you visit west part of Algarve for a day. 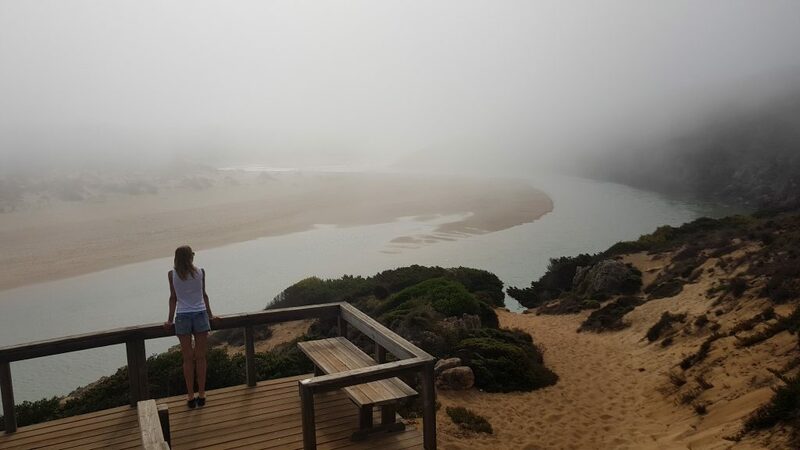 We were a bit unlucky with the weather – where all that fog came from?! 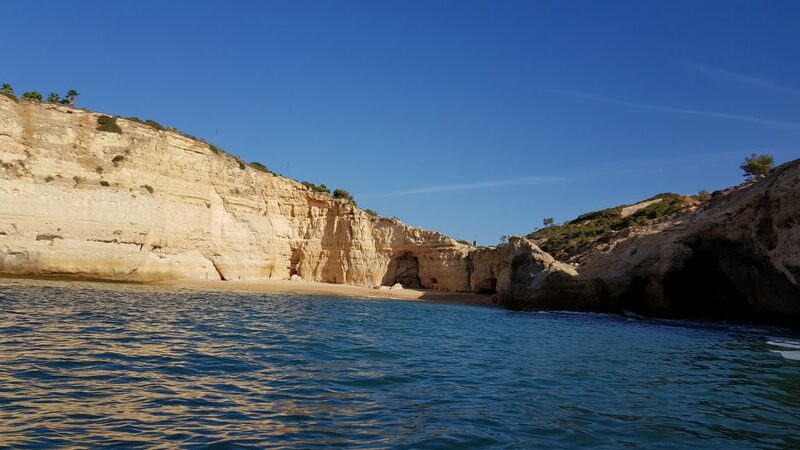 But still, we would highly recommend visiting this remarkable part of Algarve. 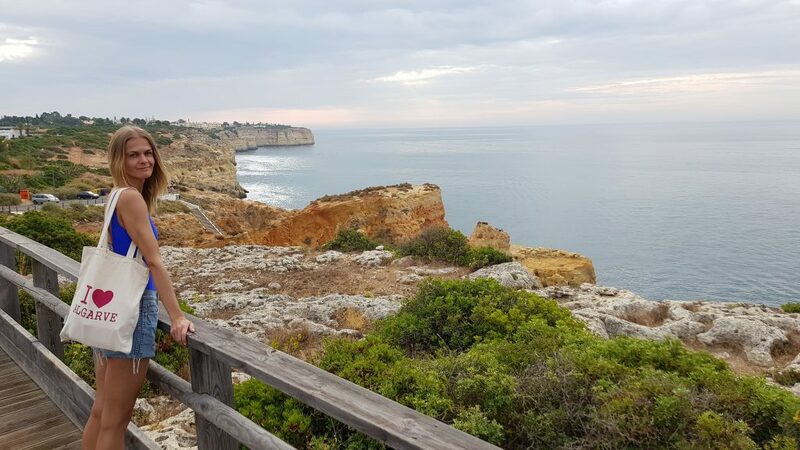 When the weather is nice, the Castelejo Viewpoint is one of the most beautiful viewing points along the amazing Vicentine Coast in southwestern Portugal. 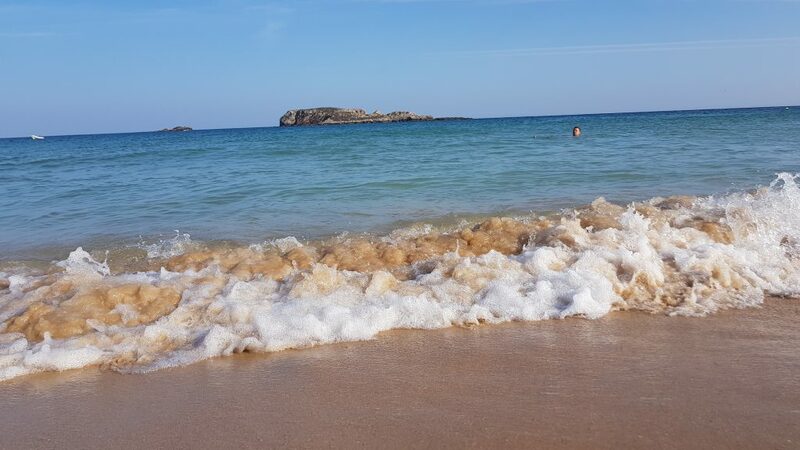 But be aware of the strong currents, which are often present at the west coast of Algarve. 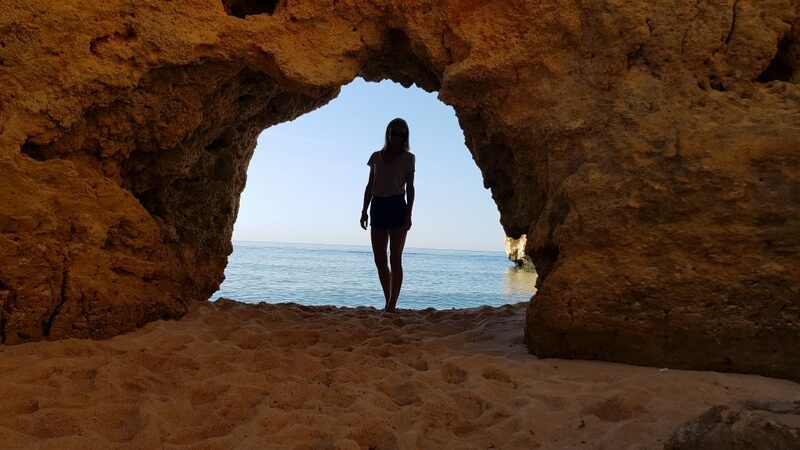 You probably know where to go in Algarve to find the best places to visit, right? 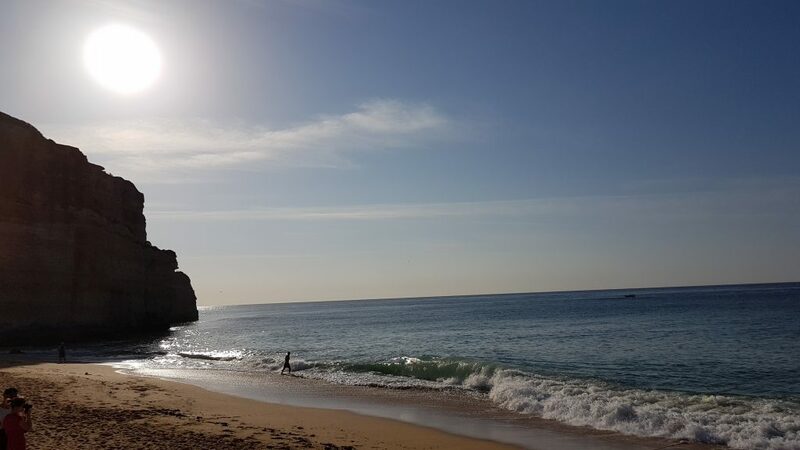 In case you don’t, we have put a list of the main Algarve’s tourist attractions and activities. 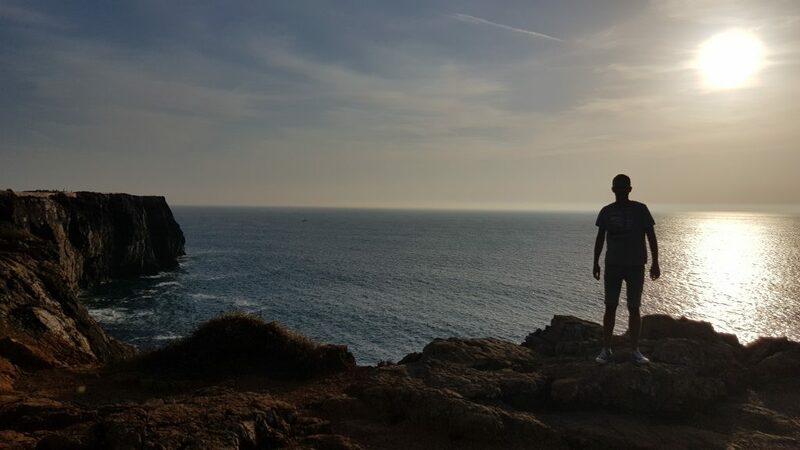 From hiking in Algarve’s coast to all the top places of interest in the Algarve. 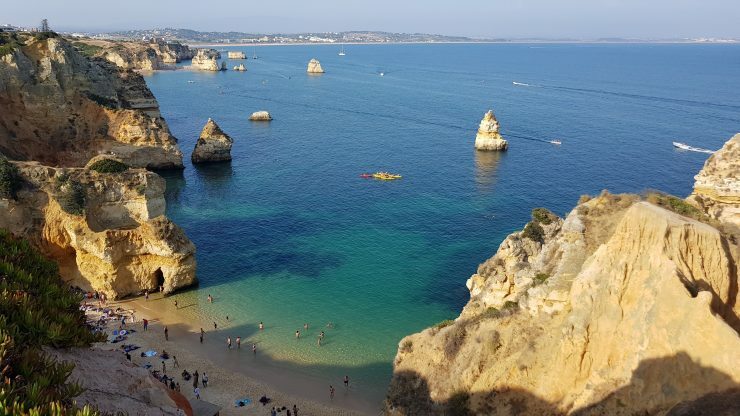 Taking a stroll around Ponta da Piedade was absolutely amazing – ahh those breathtaking views! 🙂 The sights were just stunning, we really recommend walking there. There are many great walking trails to explore, so you can easily spend a few hours over there. 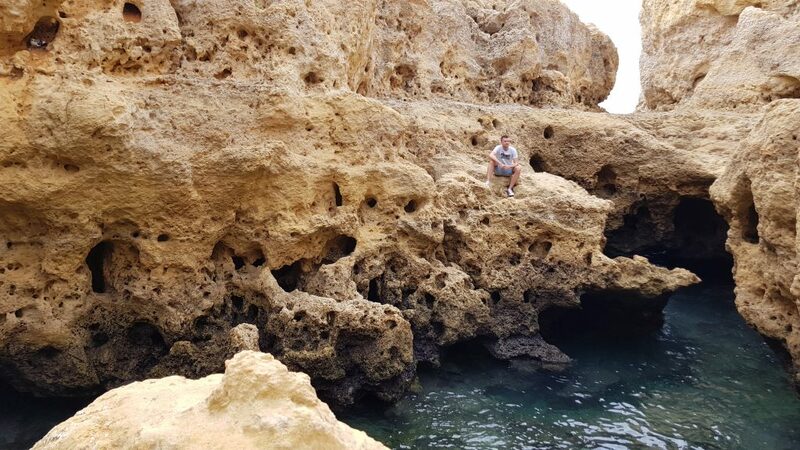 We visited Algar Seco early in the morning, which was a great thing to do. 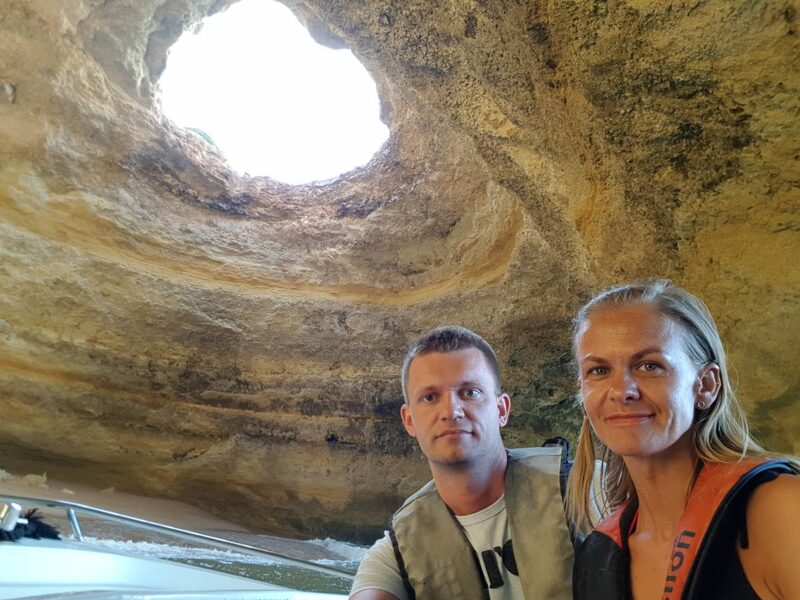 There were only two other people – so we had plenty of time to appreciate the caves and beautiful scenery! 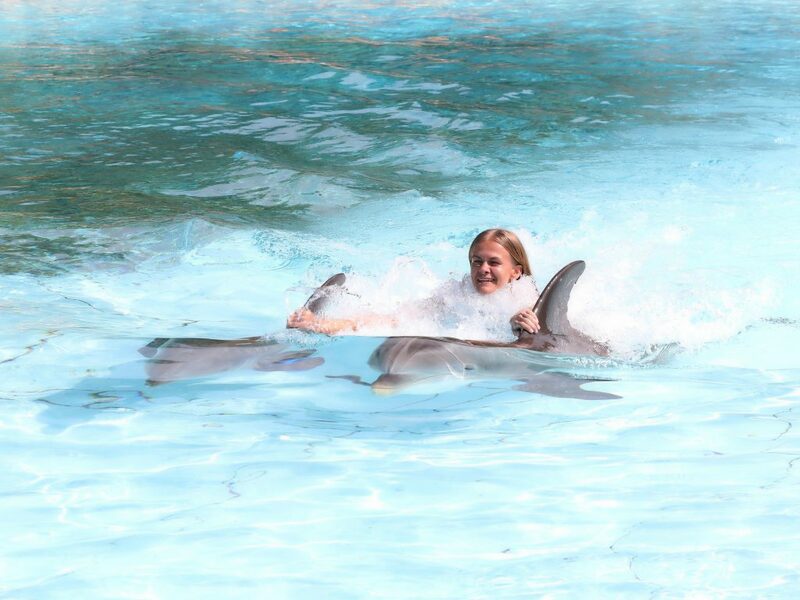 Visit Zoomarine and swim with dolphins! The whole experience was really amazing! Apart of one lady from the shop, who was kind of rude to us as we wanted to buy only digital version of the pictures (yes, you have to pay for them on top on the entry fee). 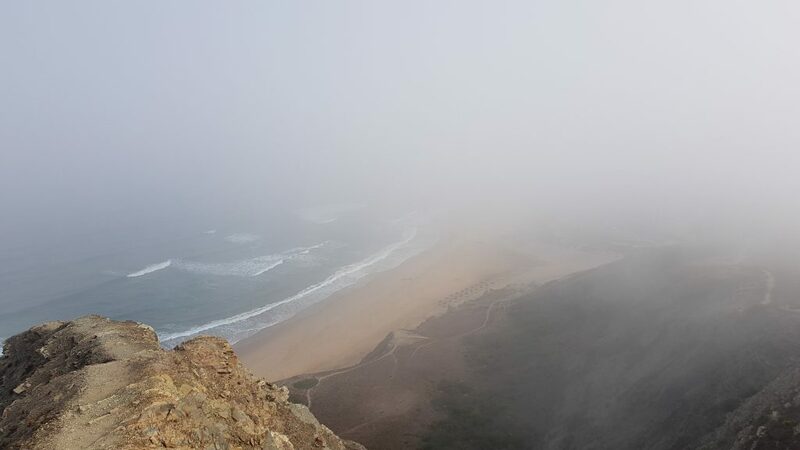 A very enjoyable walk along cliffs with amazing views. The parking was free. We visited Fortaleza on the way to Cape Saint-Vincent and spent there one hour admiring the magical view of the surrounding landscape. 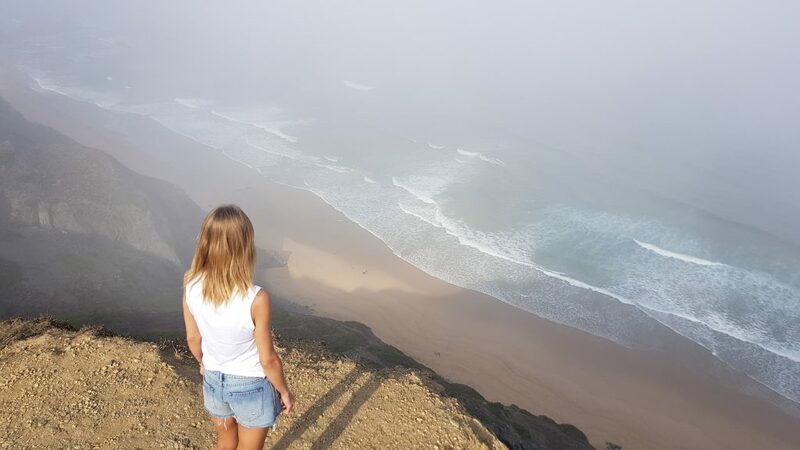 Perfect place for just chilling out or watching the surfers at Praia do Tonel. You can’t get further southwest in continental Europe than to Cape Saint-Vincent! 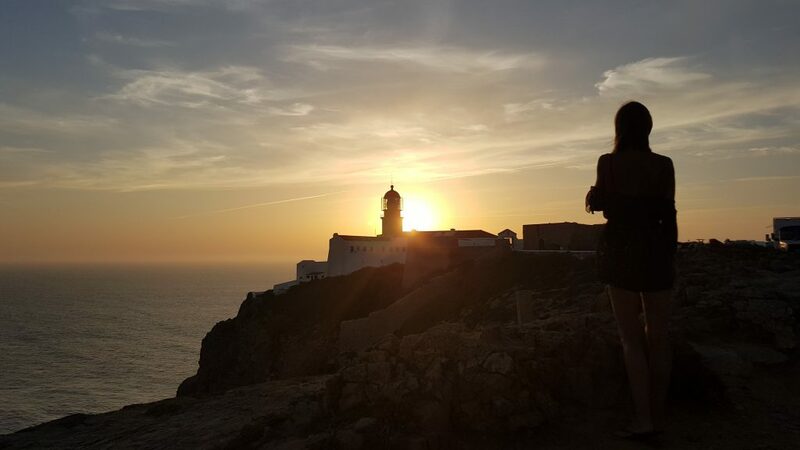 It is definitely worth coming here to see the lighthouse from 1846 and watch the sunset. 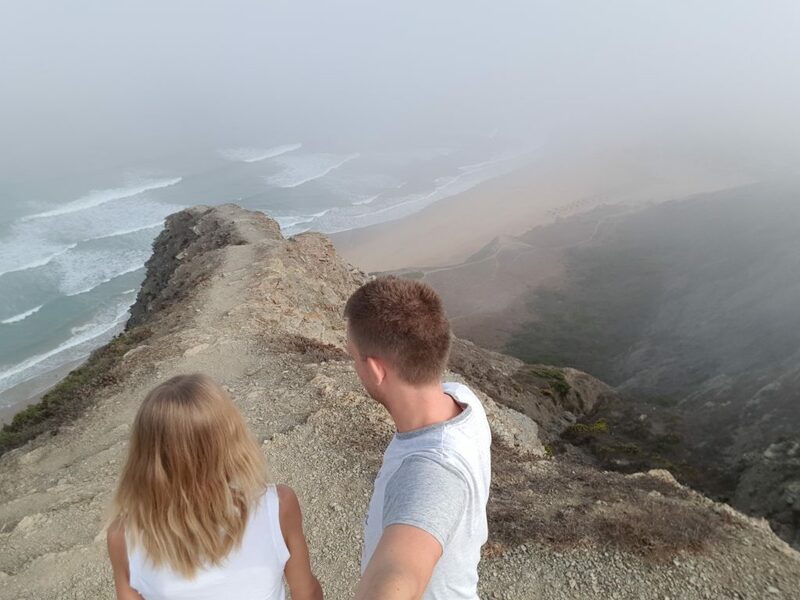 On both sides of the cape, Cabo de São Vicente offers amazing views! 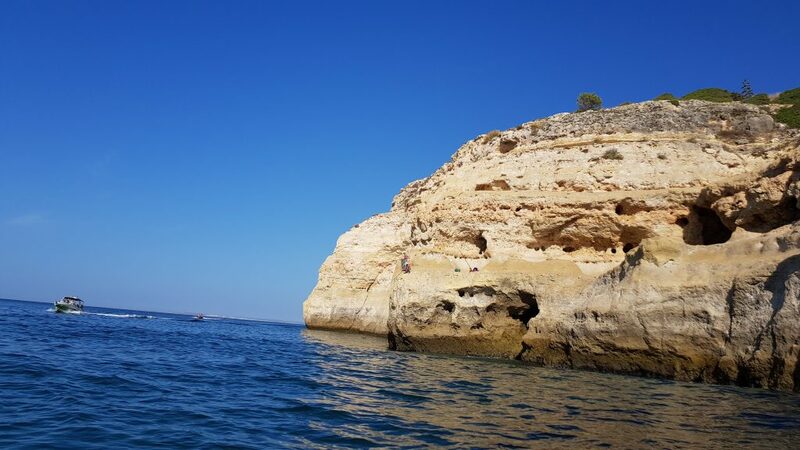 Just make sure you have time to admire the astonishing landscape of the high cliffs that fall steeply into the dark-blue water of the Atlantic. 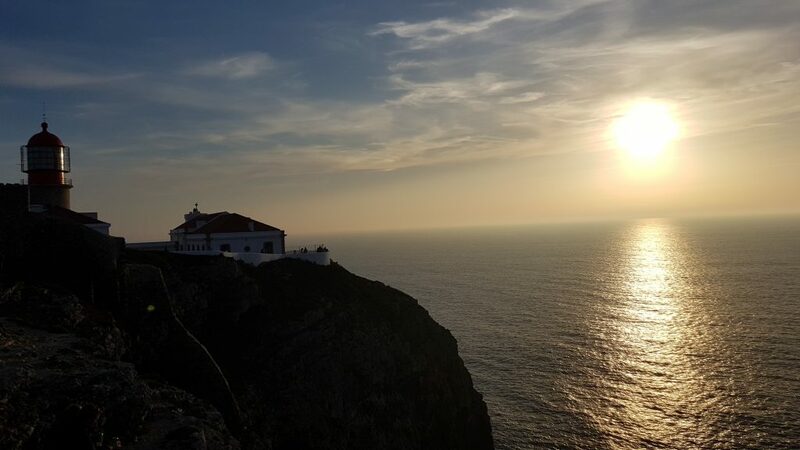 The best place to watch the sunset in Portugal? 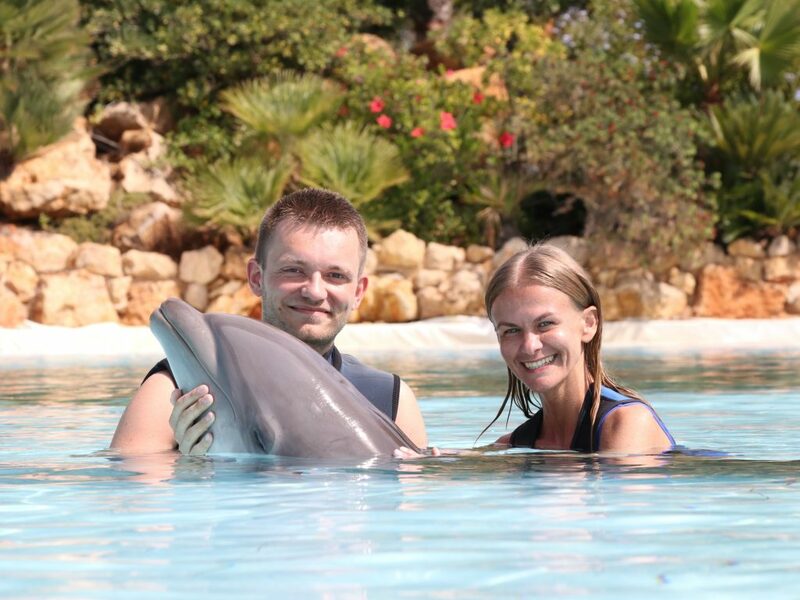 Well… end of Europe of course! But don’t even think that you will be the only one who has that idea! No! 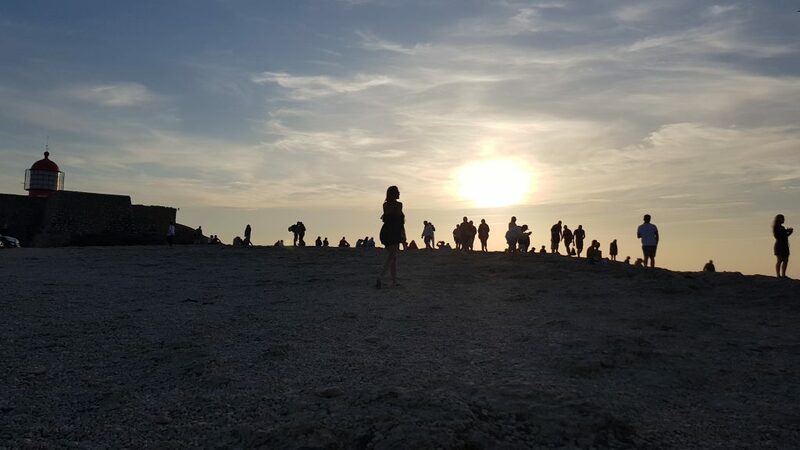 There will be probably 100s other people waiting for the sun to go down 🙂 Well, this must be then one of the most romantic places in Europe! Don’t worry – there is enough space in Cape Saint-Vincent for all of them 😉 You will still be able to take a few amazing pictures. Good news! You can buy the Portuguese Custard Tarts almost everywhere in Portugal. 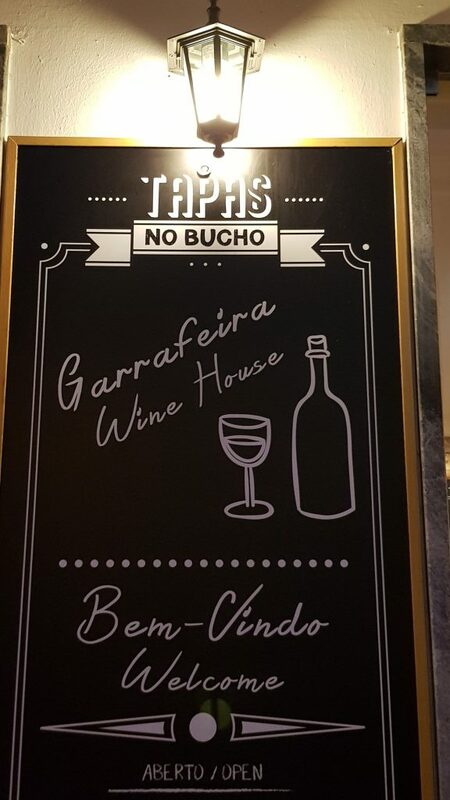 In Lagoa, Tapas no BUCHO is a must on your list! 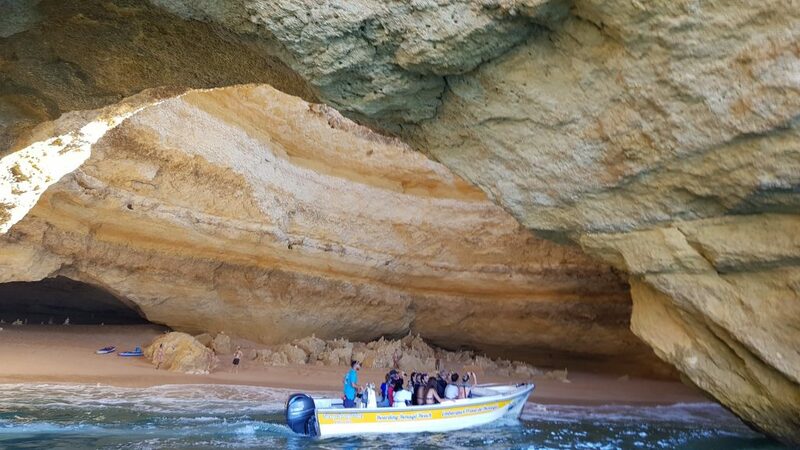 The grotto is only accessible from the ocean, but you can rent a motorboat or a kayak to explore the Benagil Cave. Make sure you reserve your ticket earlier as the guys as super busy in the high season. 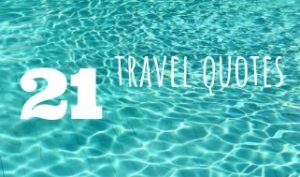 All you have to do is booking online a spot for a specific day – you will pay on the day of your trip but make sure you take cash with you! 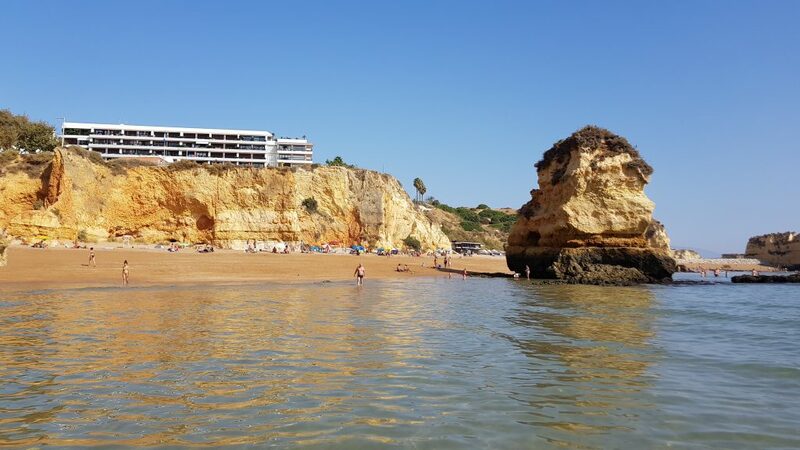 Whether you are planning a short break in Algarve or all-inclusive holiday in the south of Portugal, you will find a huge range of accommodation. The hospitality is very advance in Algarve and you can find them one of the best resorts and hotels in Portugal. 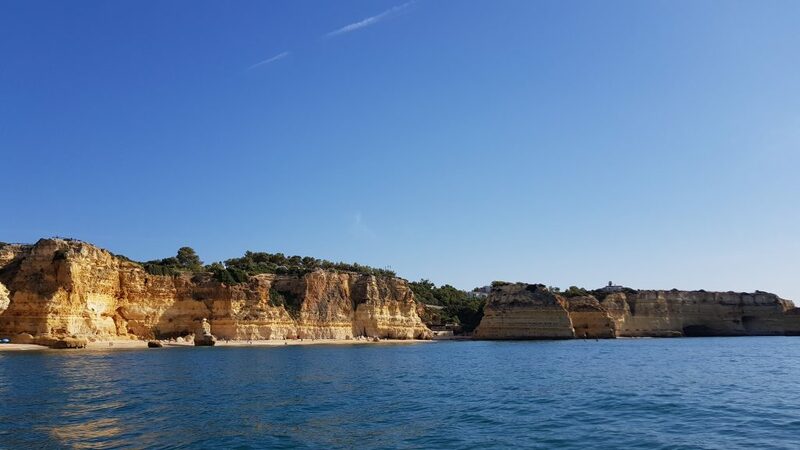 In our opinion, Lagoa is the best area to stay in Algarve. 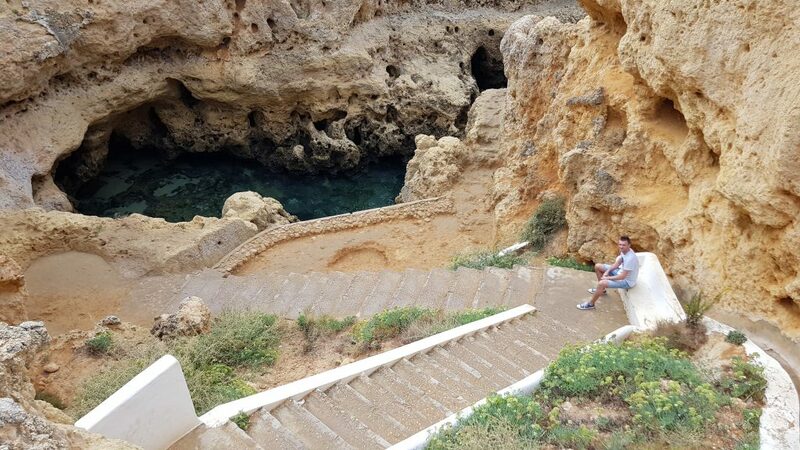 It’s located just in the middle of the region so will need max one hour by car to get to all the top attractions in Algarve. 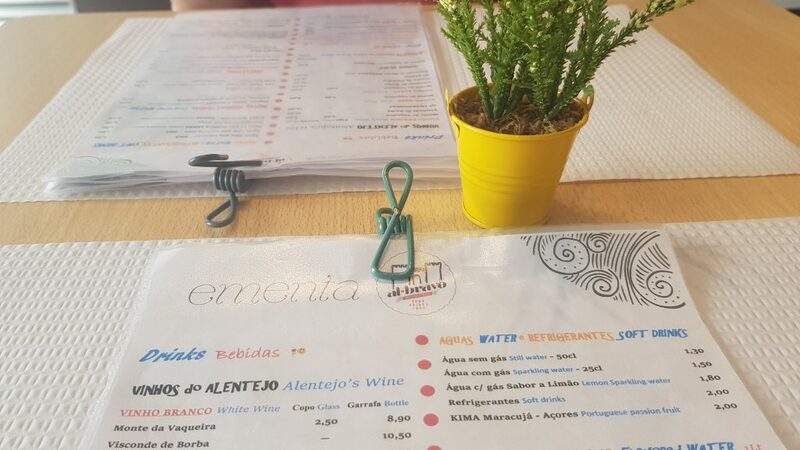 We have stayed in the Lagoa Hotel in Lagoa – yes, we know – they were not very creative with the name 😉 But we had a very nice duplex apartment with a parking space underneath and buffet breakfast! All at a very reasonable price. 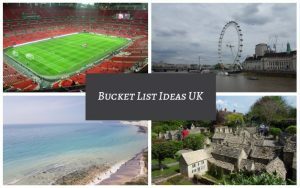 Isle of Wight things to do – TOP 11 attractions on the I.o.W. 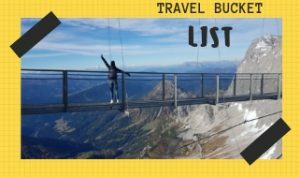 Best Inspirational Travel Quotes – Do you really need to be inspired? 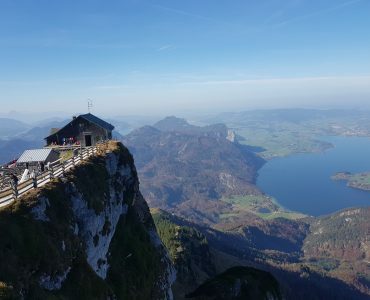 Schafberg Mountain, Austria – Europe’s travel at its prettiest!